There’s probably no other occasion in the Midwest produce season quite like the beginning of the sweet corn crop. So you can understand my frustration, when, everywhere I turn, I see some guy (or usually kid) at the side of the road selling sweet corn, and I find my own to be a few days short of ripe. 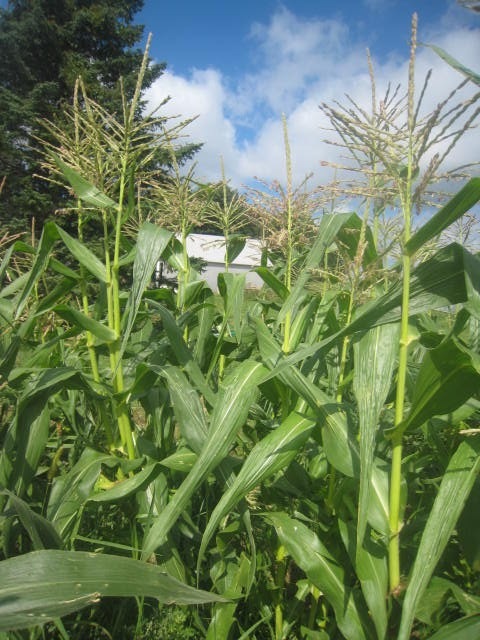 People have been asking me about sweet corn easily for the last 4 weeks even though it would take some kind of magic corn to be ripe at the beginning of July. I keep thinking these “fake roadside stands” that simply truck in corn from Iowa and Nebraska really early are messing with people’s sense of season and sense of what we can actually grow in Minnesota, especially when they put sweet corn next to some peaches next to cherries in mid-July. Still, when actual local growers are at the side of the road, I have no excuse. Raising produce commercially is often a huge juggle where each year one crop or another under or over-performs. I’m always out in the fields telling myself “That should have gotten in the ground 10 days earlier” or “Man, I should have weeded that patch earlier.” Throw in some interesting weather-a little hail here and there-and I really should be amazed that any crops come at all. The trick in what we do is to keep as many of those balls in the air as possible and keep all of them moving forward and growing. 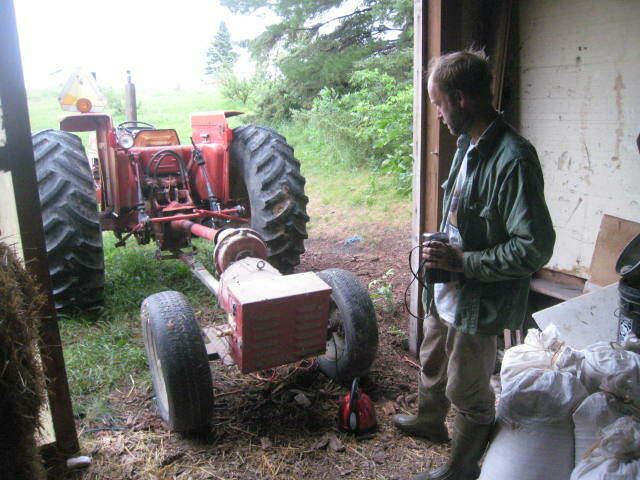 I commonly work through 5-7 different tasks a day in June and July (maybe starting with cultivating on the tractor, hand weeding a few crops, then moving to wheel hoe a couple other beds, etc). If I get stuck too long on any one crop or job, I can easily miss the window to take care of another crop, and, yes, sometimes a crop just gets written off. So, in the context of all this juggling of 60+ different crops, sweet corn appearing a bit late shouldn’t be the end of the world, but I still feel a bit like a professional musician who missed hitting a C chord on stage. As you’ll see from the delivery this week, we’re starting to get into high season. Green beans have come into season and we were able to get a couple peppers for everybody this week too. No tomatoes or sweet corn yet, but they are just around the corner. Reminder: We’re having our open house at Lida Farm this Sunday, July 22 from 2-4 pm. Come on out, have a little drink and a snack, and check out how the crops are growing. This is open for member and non-members alike, so feel free to bring a friend. Savoy Cabbage: I promise not to give you any more cabbage for some time…I think it’s been 4 weeks now. But cabbage keeps forever in a refrigerator and this stuff was just so beautiful I just had to put it in the box. Braising Mix: These are the frilly, purple and green bunch of greens. These are cooking greens. Fresh Thyme: The little tiny bunch of fragrant herbs. If you’ve never cooked with fresh herbs, this is your chance. I’m sure you’ll taste a difference. Bunch of Beets: These are a mix of Chiogga and Red Ace. The Red Ace are your standard beet and Chiogga are a brighter red and striped red/white on inside. You prepare as you would any beet. A couple Sweet Onions: There’s a red torpedo onion and an Alisa Craig. Th big Alisa Craig is more mile if preparing things with fresh onion. We’ll the spring brassicas (cabbage, kohlrabi, broccoli) are working their way past the finish line; I have the flail mower on the tractor and ready to mow them down. This allows us to clean up the field as well as make room for a new crop. But even while I eye the spring brassicas, I took an hour yesterday and planted the fall brassicas, including broccoli, cabbage, and cauliflower. The nice think about fall brassicas is that they typically do better than their spring brethren since they have a long cool fall to mature. I’ve given up trying to raise cauliflower in the spring which simply gets purple and ugly due to stress in the summer heat. This two season cropping is also common with other veggies on the farm. We also have a spring and fall crop of spinach, cool-season greens, and head lettuce makes a comeback as well. So, if you’re a cool-season veggie-eater yourself, don’t despair; just wait a couple months. Summer Squash – we mostly had zucchini but there are some yellow zucchini and yellow staightneck squash too. Fresh or “green” garlic – this is uncured garlic which is a bit stronger tasting than cured. You can simply leave on your kitchen counter for a week and I’ll dry down if you’d like to cure yourself. Purple Kohlrabi – I know, you’re sick of kohlrabi, but at least this one’s a different color! Frisee – the frilly green also called curly endive. This is in the endive family, so has a nutty flavor. It’s typically mixed in a lot of salad mixes you would buy. Note – check out our facebook page where we’ve been posting a picture of the box each week with each veggie labeled. Dice onions, bacon, and greens. Fry bacon in skillet together with the onion or garlic. When the onion gets translucent, throw in greens until wilted and season with some salt. Done. If you like heat, add red pepper flakes.